These moths are the major cause of maggot damage in tree fruits. 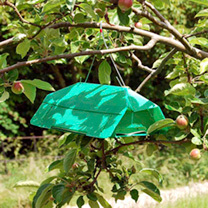 The traps use the pheremone scent of the female moths to attract and catch the male moths, and should be hung out at the end of May (early May in urban areas). Each trap comes complete with hanging wire and contains everything you need to protect up to 5 average size trees within a range of 15m (50'), for one season. Refill in subsequent years.